As a jewellery designer I'm always on the look out for new materials to work with and earlier in the year I came across Silver Creek Leather and their recently released Realeather Jewelry collection. When I first saw these components, it completely stopped me in my tracks. It was one of those moments where you catch your breath and think, "Wow! How clever!". This collection is different to anything else you've seen. These are quality components: contemporary and very cleverly designed. 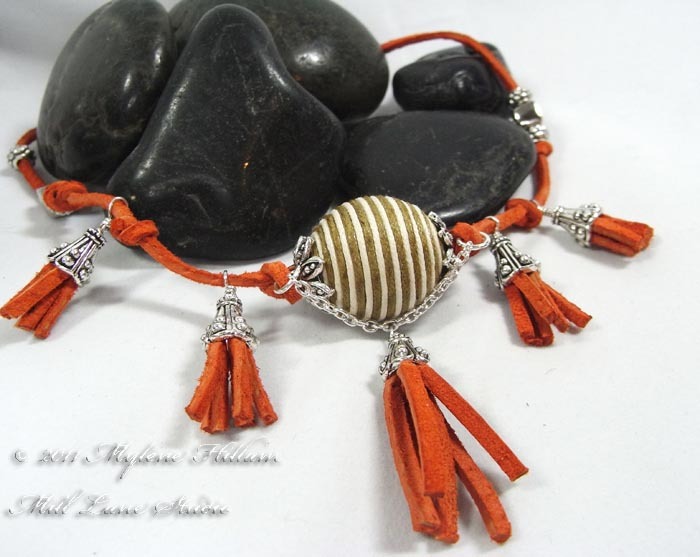 They bring together leather crafting and jewellery making in a really unique way. Here are some of the things I like most about the collection. The focals and slides - stirling silver plated and interchangeable. These have a screw backing so that you can screw out one focal and replace it with another for a totally new look.... how versatile! 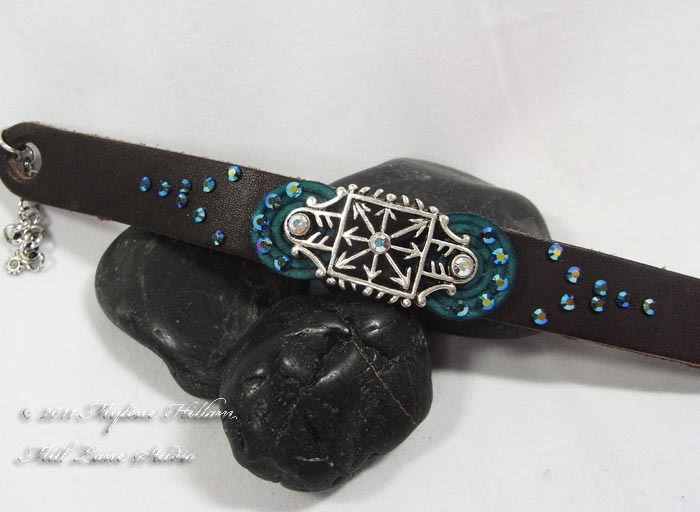 They work really well with the leather bracelets which have pre punched holes perfectly aligned to accommodate them. I also love the magnetic Bird Cage Knot Tie clasps. 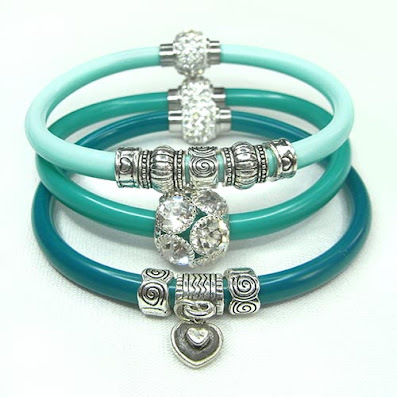 These cleverly hide away the end knots of multi strand pieces of jewellery. And another cleverly designed component is the Pinch Bail necklace and earring components. Just place a suede shape from the collection into the pinch bail (they come in brights, pastels and earthy tones), pinch the bail closed and then add beads to finish it off. 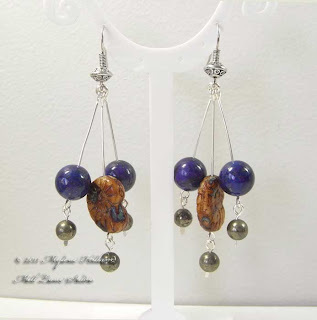 There's a whole lot more to this collection such as large holed beads in both metal and glass, components with real lizard skin inserts, magnetic clasps and other decorative elements and they are all sterling silverplate or made from quality leather and suede. I was so excited by the collection that I couldn't wait to get back to my studio to start creating with them. 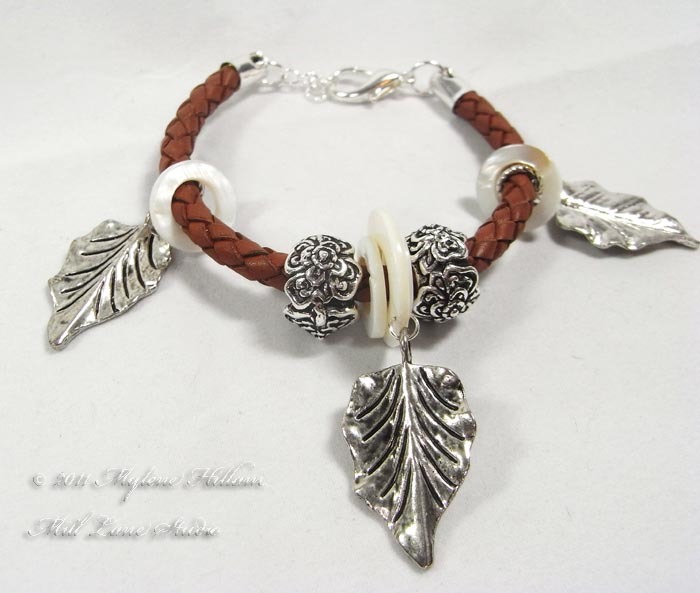 Here I've combined a braided bracelet and beautiful silver plated flower beads from the collection with some silver and shell components from my own stash. Don't they work well together? I had a heap of fun playing with the Sof-Suede lace I brought home with me. 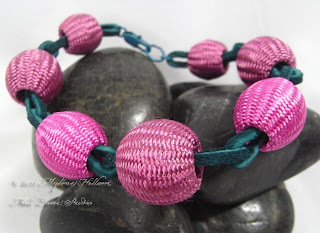 True to its name, it's soft and pliable and lends itself well to being coiled (as in the bracelet at top), folded, wrapped, knotted and plaited. In this bracelet I've created a chain from Sof-Suede. Join lengths of Sof-Suede with a suitable adhesive and thread on a large holed bead. Thread the lace for the next chain onto the previous one before gluing the ends together. These "berries" are from my own collection. Creating tassels and knotting the Sof-Suede lace is a breeze because it's so flexible that it folds back on itself easily. Just take lengths of Sof-Suede lace and twist them in the middle with wire. Thread the wire through a bead cap, pull the tassel firmly into place and then create a loop. Easy! This is such a classy collection of mix and match components. It's worth spending some time looking over their catalogue and reading the product descriptions because you won't realise just how clever these components are until you do. Check the distributors page for where to find the collection. Here's an important update about the BCC Art Bites Resin Workshop. Due to renovations at the original venue, the workshop has been moved to a new location. The workshop will now take place at the Mt Gravatt Community Centre at 1693 Logan Road, Mt Gravatt. 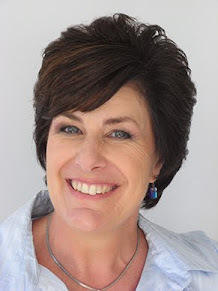 I'm really excited to share some other news about the workshop too; we will be joined by a camera crew who will be filming a segment for Channel 10's Totally Wild! I don't have specific details yet, just that they will be filming. Let's hope we don't all get camera shy! It's just 5 short days away, so let the countdown begin. For those of you who managed to secure a booking, prepare yourself for some very resiny fun! Want to be lucky this St Patrick's Day? 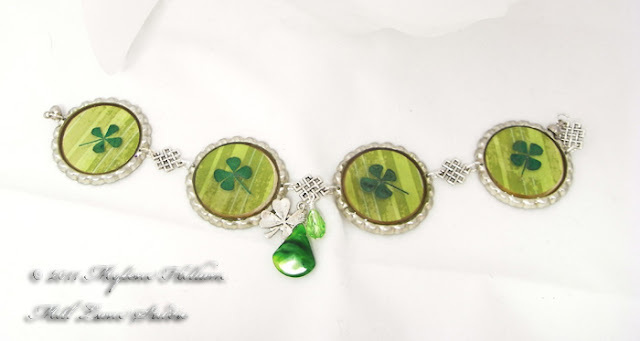 Then why not make yourself a bracelet from a lucky Four Leafed Clover! Use the hammer to flatten the bottle caps to give them a nice border. Punch as many circles from the scrapbook paper as you need. My paper didn't require sealing but some papers do. If yours does, then use Translucent Liquid Sculpey. Do not use Mod Podge for this project - it's not compatible with Magic-Glos. If you're not sure if your paper needs sealing, then seal it anyway. To do this, coat the back and the front AND the cut edge then bake in the oven on non stick cooking paper, following the manufacturer's instructions. Whilst the paper circles are in the oven, you can continue with the next step. Squeeze a blob of Magic-Glos into the centre of the bottle cap about the size of a 1c coin and spread it out to the edges. Place a paper circle in the Magic-Glos and press it down so that the resin oozes up around the outside of the paper. Place another blob of resin in the centre and spread it out to the edges so that it fully covers the paper. If there are any bubbles, pop these by passing a BBQ torch briefly across the surface. Keep it moving at all times. Place the bottle caps under the lamp (or in the sunshine) for about 10 minutes to cure. Apply a four leaf clover sticker to the centre of the bottle cap. Cover the entire surface with Magic-Glos and cure for another 10 minutes. Add any embellishments such as rub-ons now, then apply another layer of Magic-Glos, add the crystals and then place under the lamp until cured. Turn your lucky four leaf clover charms into jewellery by drilling holes in each bottle cap and assembling them with beads and charms, and then finally, add a clasp. I hope you have fun creating your own lucky charms for St Patrick's Day. May Irish good fortune smile upon you today! 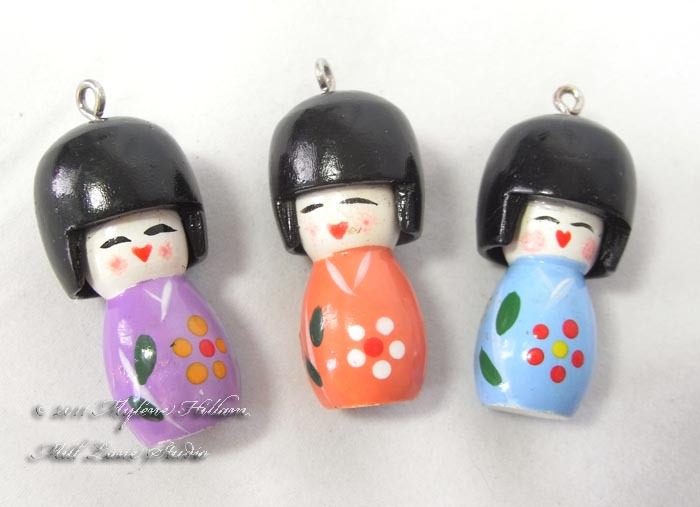 Aren't these little Kokeshi style dolls adorable? Kokeshi dolls are originally from the northern region of Japan and were handmade from wood. They are instantly recognisable; their simplistic design includes a rounded trunk, enlarged head and a lack of arms and legs. They are also painted brightly with very simple detailing. Traditionally they were made by master craftsmen but these days they are mass produced as souvenirs for the tourist industry. 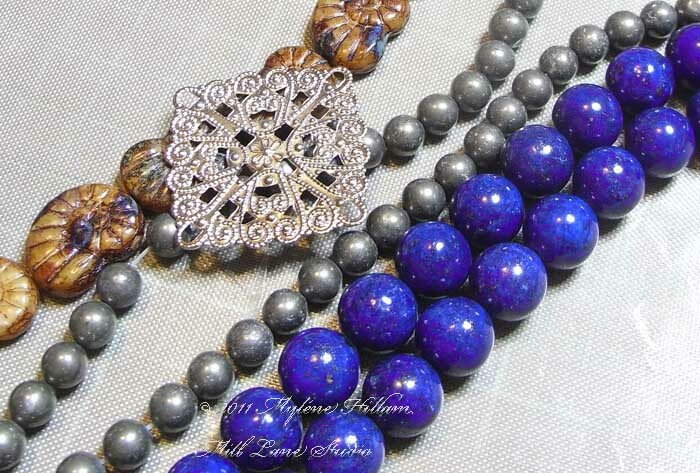 I got these from Beads Online. And whilst they are not strictly traditional, they are really cute. Cute is not a style I work in very often so it will be a challenge to see how I can incorporate their quirkiness with my style. From time to time it's good to step out of your comfort zone and work with an unfamiliar product or style. 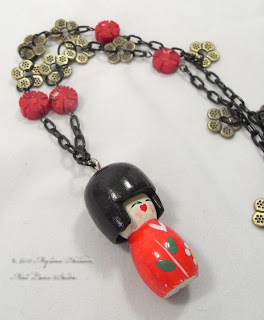 That's exactly what I did this weekend with these Kokeshi pendants. I found them so very appealing, but I had absolutely no idea what I was going to do with them. And so there I was, confronted with the proverbial blank canvas and that very uncomfortable feeling of not knowing quite where to start. These pendants demand to be the centre of attention but how do you work with such a dominant feature and stay true to the minimalistic style associated with the Japanese culture? Sure, I could have just strung them on a length of cord or chain, but I was looking to incorporate some of my design skills here. So, first thing I did was raid my stash to see what I have that might work with them. 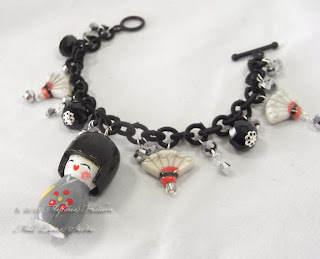 I was looking for items that were similar (or complimentary), beads and charms with a Japanese feel, striking chains, bold colours: anything which felt even remotely Asian. 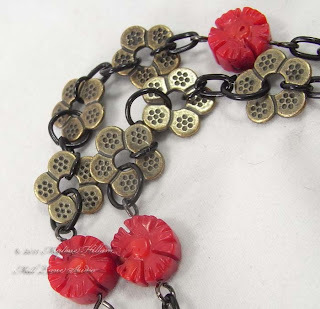 And here's what I found: black chain, some lovely five petal metal spacers, red coral flower beads, some great glass fan beads and crystals in both black and mirrored gunmetal for sparkle. I also found some metal charms in the shape of pagodas and fans but neither of these made it into the finished pieces. I have several different black chains in my studio to choose from and for the first piece I settled on a polyester chain from Beadalon. I love the look of black chain but there are limited jewellery findings to go with it. You can substitute gunmetal if you're really stuck but I've now got a small collection of black findings and I add to that collection every time I find more. You can see here that I've used a black toggle to connect the bracelet. 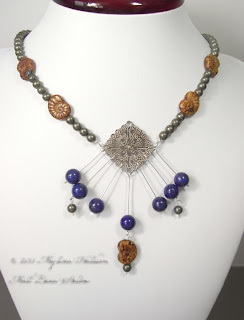 I stuck with the silver findings for the rest of the piece though because it worked with the other silver elements. I know that I have black headpins and eyepins in my stash but a recent cleanup has resulted in them becoming put away so safely that I can't find them - isn't that always the way? So I've used gunmetal for this next piece. It still works because only the loops of the eyepins show and it's not very visible. But for the rest of the chain and connectors I've used black. You could always make your own jump rings from black wire but I had some on hand so I've made use of them. This piece is so sweet. I love the way the burnished gold flowers and black chain work together and the sprinkling of red coral makes it all pop. I think the five-petalled spacers even look a little bit Japanese! In the end, the simple treatment was the best way to go; Kokeshi Dolls don't need a lot of ornamentation! They are bright and happy and that is what I wanted to capture. And I think I've succeeded. This ended up being a really fun challenge for the weekend. 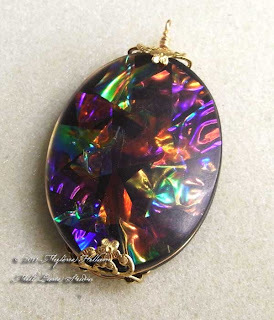 Not quite an Opal and not quite dichroic glass, but it's certainly eye catching! 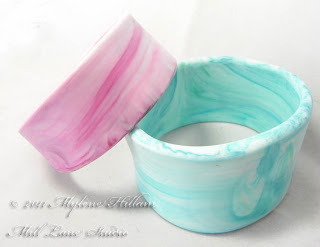 This is one of the techniques you learn in my Resin Jewellery Workshop. One of the fun things about working with resin is the myriad of items that you can embed. 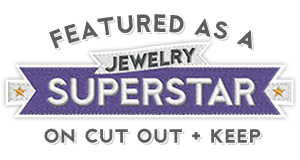 Whether they be found objects, charms or iridescent mylar as in the sample above, resin will allow you to create your own really unique focal pieces. 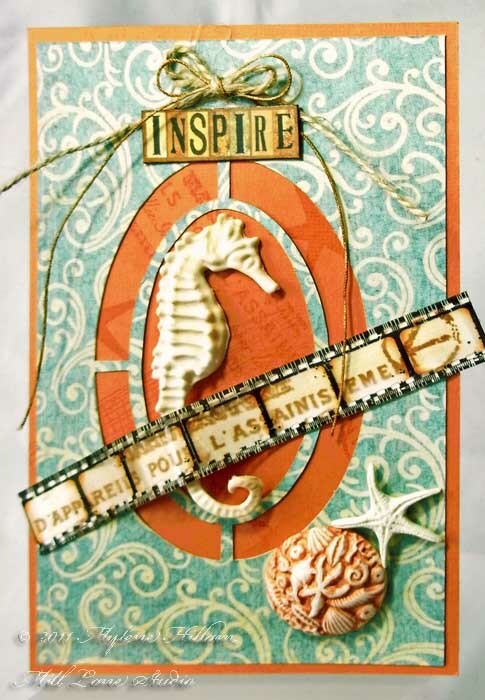 This piece is made using Krafty Lady Art Mould AM282. It's quite a large piece, measuring about 5.3cm x 4.0cm, so it gives you a lot of surface area to create a really interesting design. Such a stunning cabochon needs very little in the way of decorative elements so I've kept it simple and just wired it to a filigree stamping. Filigrees are wonderful decorative elements and despite their lacy and elaborate appearance, they can compliment even a busy piece. 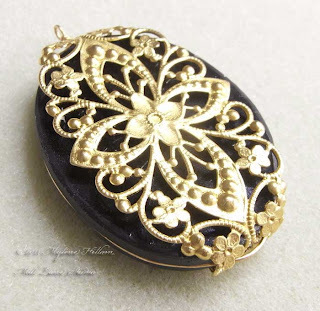 This one does a great job of holding the cabochon in place without detracting from it and yet, when you turn it over, the filigree is the star of the show. If you'd like to learn the technique for creating this razzle, dazzle, opalescent wonder, why not book yourself in to a workshop. 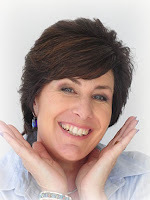 You'll learn a host of tips, tricks and techniques along the way.